Leona Wood - AMANites.. lets stay connected! Leona was born on May 21, 1921 in Seattle. As a child, she studied ballet and also learned Caucasian folk dances. She began drawing and painting at an early age, and at sixteen, entered the annual Pacific Northwest show at the Seattle Art Museum. She received a fellowship to study design in San Francisco at the school of Bauhaus artist Rudolph Schaeffer. Leona married Alaskan born physicist Philip Harland in 1939. Shortly after, they moved to New York City, where she worked as a designer and illustrator at Dorland International, Pettingell and Fenton and produced book illustrations for Doubleday. During this period, she was also exhibiting at the Julien Levy Gallery, along with artists such as Salvador Dalí and Eugene Berman.In 1947, Leona and Phil moved to California. When De Beers launched their “A diamond is forever” advertising campaign, they hired such visionary artists as Picasso, Salvador Dalí … and in 1957, Leona Wood. Her works received special notice in a 1959 Newsweek article on the “Art: USA: 59” exhibit in New York.In the 1960s, the Harlands were active in the UCLA Department of Ethnomusicology, where Phil was teaching drumming. When he began playing at Middle Eastern venues, Leona learned Middle Eastern dance in order to accompany him. Before long, the Harlands formed Friends of Arabic Music, a music and dance group, and they became a feature in the Westwood folk dance world.The Harlands’ group often performed with the Village Dancers, led by Anthony Shay. Tony found her to be a “mesmerizing, spectacular performer” and urged her to join forces. In 1963, they co-founded the AMAN Folk Ensemble. 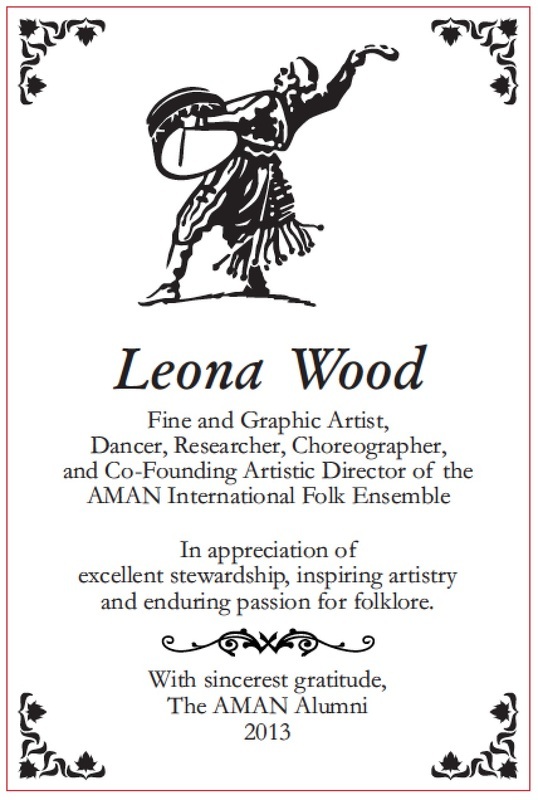 AMAN was the first local dance company to be presented at the Los Angeles Music Center.Inspired by her involvement witth costume design for the company, Leona began painting Middle Eastern dancers and their milieu in the style of 19th century Orientalist painters.In 1980, she received a grant from the National Endowment for the Arts to stage a Kwakiutl winter ceremonial for AMAN. She commissioned three ceremonial masks from artist Duane Pasco, and designed the mise en scène, including a dance screen hung upstage, and a fire that lighted the stage from the center rather than the wings. Martin David called the number “a visual masterpiece.”Leona taught courses on Middle Eastern dance in a cultural context at UCLA extension, and continued to participate in UCLA’s Department of Ethnomusicology for many years. She wrote numerous articles on Middle Eastern and other forms of dance. Her paintings were exhibited in the Lane Galleries in Westwood, California for over a quarter of a century. Although she stopped showing shortly after Phil’s death in 1980, she continued to paint even more prolifically. Leona Wood died in her home in 2008.